The Utroms and Donatello reach the tepui in Venezuela and find the anti-grav tug of the previous expedition. Oddly, it has been stripped of all useful tech and resources as if deliberately salvaged. Suddenly, one of the weird wood-creatures appears and fires on them with a weapon. They scare it off with a blast from the tug’s defensive systems and then land in a clearing. As they investigate the weapon the wood-creature dropped, one of the Utroms tells Don that it’s of Utrom design. In the attic of the Jones residence, April and Casey set up the Super 8 projector and watch April’s old home movie. As she observes her father draw in his sketchbook and play with her older sister Robyn, April finally has an epiphany. Casey doesn’t see it so April explains: Robyn is four years older than she is, however, in this movie she’s only two. What’s strange is that Mr. O’Neil is clearly drawing pictures of April as a baby in his sketchbook… even though that should be impossible. 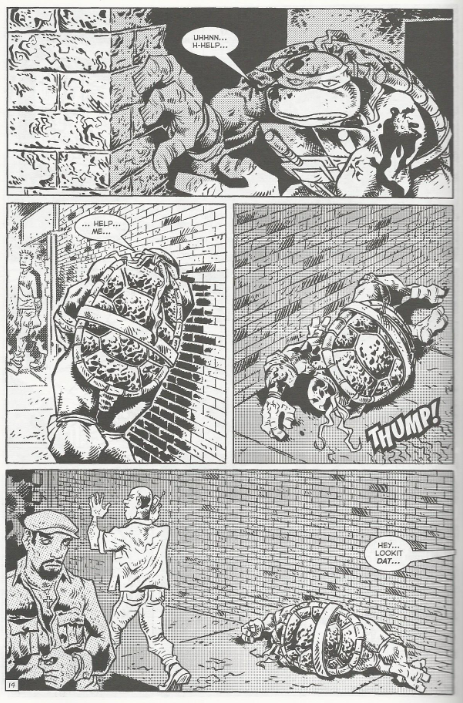 In an alley in New York, the badly injured Raphael hobbles onto a main street, looking for help. He finally collapses and a pair of thugs decide to follow the recommendation of the Xihad and eliminate the “alien scum”. They start kicking Raph, but are promptly scared off by the Fugitoid, who transforms into his giant robot form. Glurin calls for pickup from the Kurtzburg Memorial Hospital. On the Moon Island, Michelangelo waits nervously in the transmat receiving room for his assigned tourist: The Regenta of Y’Nood Minor. The other tour guides chuckle at his assignment, remarking that the Regenta, a Styracodon royal, is notorious for being a spoiled, temperamental brat. 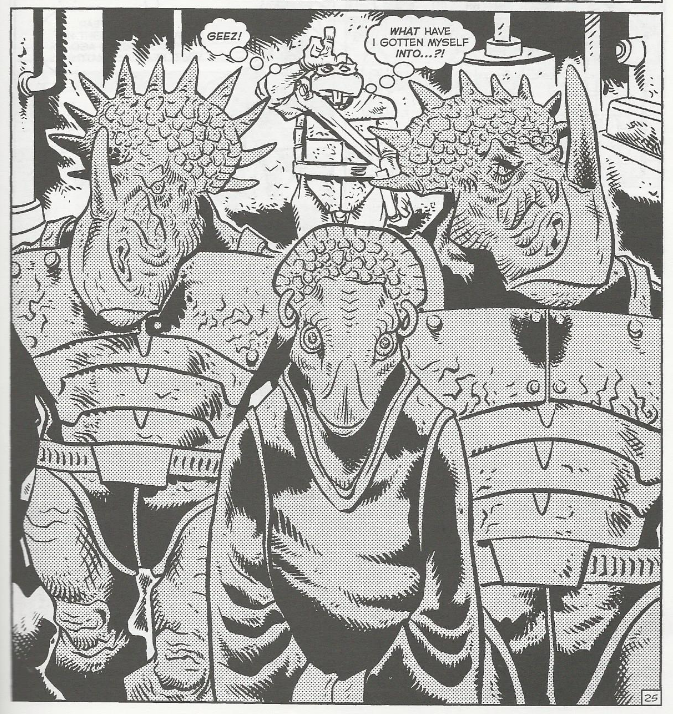 The Regenta arrives with her two Styracodon bodyguards, though she immediately insists on replacing Michelangelo as her tour guide, demanding an Earth native. Mikey explains that he IS a native, just not a human. The bodyguards don’t care for his tone and Mikey tells them to watch it, as he’s bested plenty of Triceratons in his time (to which the Styracodons take offense, being compared to their "distant cousins"). Before they can fight, the Regenta breaks them up and demands to be taken to the Museum of Natural History. At Kurtzburg, Zippy Lad meets with Professor Honeycutt to see about Raph’s condition. The Fugitoid tries to explain that things have complicated since he initially arrived and Raph has been moved to the maximum security wing usually reserved for the treatment of super villains. Zippy Lad peers into the viewing window of Raph’s cell and is horrified to see that Raph has begun transforming into a hideous, slobbering monster. *This story is continued from TMNT (Vol. 4) #12. The story continues in TMNT (Vol. 4) #14. 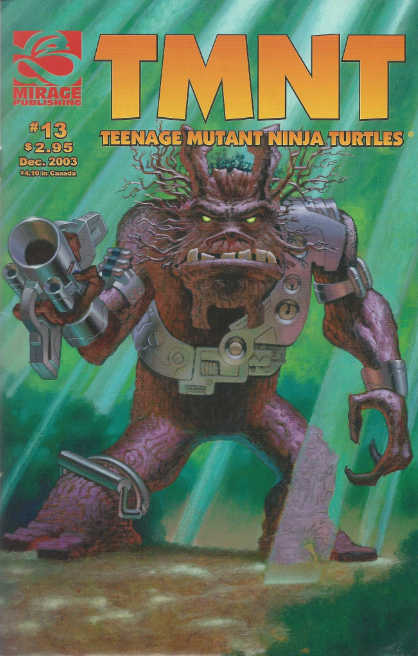 *Chronologically, the Turtles previously encountered the Styracodons in Tales of the TMNT (Vol. 2) #29. When you can boil down the progress of a character’s arc into one small paragraph per issue, then you know you’re gonna be in for a long haul. Beginning here, with each character separated from the pack, their storylines are going to be moving forward in tedious little bites. As a result, it’s never going to seem like much is happening in each issue because, um, not much IS happening in each issue. Pack a lunch, everybody. This is gonna take a while. For Donatello, there isn’t a lot to discuss. They see a wood-creature and land their anti-grav tug. Yeah, that was cover-worthy. April does some detective work and makes a startling discovery. Sort of. I hate to break it to you, but this is issue #13 and the mystery of April’s birth isn’t going to be revealed until issue #22. We’ve got a loooooong way to go. And it isn’t because the mystery is deep, just that again, it only moves at 4 or 5 pages per issue. Raph’s begun his mutation into “Gameraph”, as he’ll be called in the letters pages. I’ll give this portion a little credit as it actually gives the whole Kurtzburg setup from the start of the volume a purpose. Laird really labored to introduce that place and I’d forgotten he’d done anything with it afterward. So I guess there’s a little payoff to be enjoyed. Then there’s Mikey, who meets the Regenta and that takes 9 pages. Not a whole heck of a lot to fill 9 pages, but 9 pages. I guess that’s another thing worth noting; this is NOT an economical comic. So much more progress could be made across 9 pages, but the pacing and layouts just drag and drag and draaaagggg. Honestly, even with all the arcs broken up like this, the comic really could have done better at getting to the point and maximizing its space (especially when issues have 30 pages or more). The dialogue is no saving grace, either. I’ve remarked on this before, but Laird has a habit of abusing the ellipses to the breaking point. The ellipses is NOT a substitute for the period. That’s not how it works! Nothing else to say about this issue other than that the inside cover features a photograph of Peter Laird and Stan Sakai riding a pair of Segways and it is hilarious. That was an embarrassing fad from the early 2000s I’d forgotten about completely. 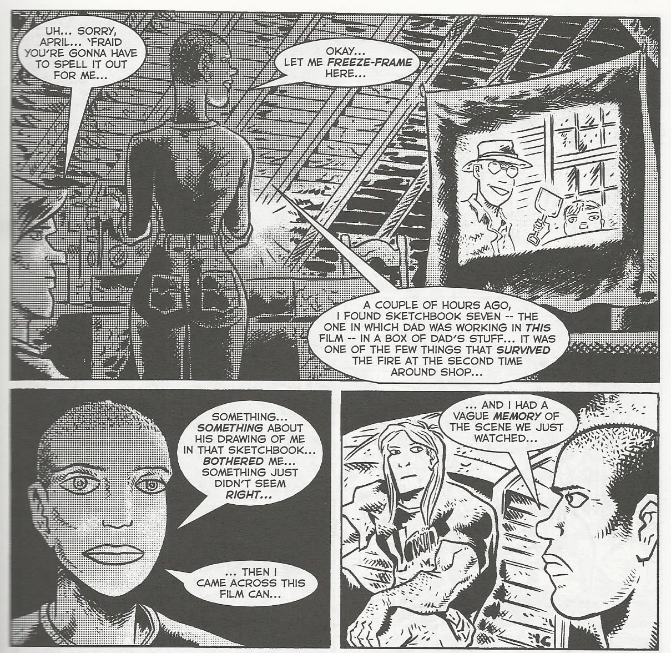 Here is a stumper: who is worse when it comes to comic dialogue: Laird or Bendis? Seriously, though, Laird was actually fine or decent enough with dialogue pre-2000, so I don't know where the ellipse abuse in Vol. 4 came from. Anyone know?